If you’ve ever driven an electric vehicle (EV), you might know the frustration of arriving at a charge point only to discover there are no free spaces. If you’re running low on juice, it could mean a worrying and rather slow drive to the next available location. Zap-Map, however, aims to fix this. One of the leading charging platforms in the UK, Zap-Map has just announced the launch of its app for EV drivers in the Republic of Ireland, incorporating live data from ESB and its network of over 1,200 charge points across the country. One of the biggest problems with electric vehicles (EVs), I feel, is cosmetic, leaving aside range anxiety or the hassle of finding a free charging spot. Tesla’s Model S might be a gorgeous looking car, but you couldn’t say the same of the more popular and more affordable Nissan Leaf, the Renault Zoe or the Kia Soul EV. Though beauty may indeed lie in the eyes of the beholder, perhaps good looks simply come at a premium in this segment – the Model S starts at €81,086, the BMW i8 at €142,360, far outside the budgets of many motorists who buy with their eyes as much as their head. Nissan’s Leaf is an affordable electric car which has got a lot going for it in terms of comfort and ease of use, even if it isn’t the best looking vehicle on the market. Ford have an electric Focus which doesn’t look altogether different from the outside. Mitsubishi’s i-Miev might look a like a bug which has crashed into your windscreen at speed, but it’s a useful city car and isn’t all that bad to drive. Even BMW have got in on the act, with their luxury i3 and the electric sportscar, the i8. And eventually we’ll see Tesla’s beautifully crafted Model S reach European shores, looking for all the world like the offspring of a Jaguar and an Aston Martin. For the electric car enthusiast there’s quite the range of options, a list which continues to grow. These vehicles have one thing in common – they’re all road cars, designed for smooth tarmac, urban (and rural) roads. And if you want to delve deeper, off road, via battery power? The options are limited. There’s Toyota’s RAV 4 EV, but that’s only sold in California. Porsche, meanwhile, have launched a hybrid Cayenne, although that is likely to be out of reach for the ordinary EV driver. You could always try to manoeuvre a BMW i3 around a muddy track, but you’re not likely to get very far. 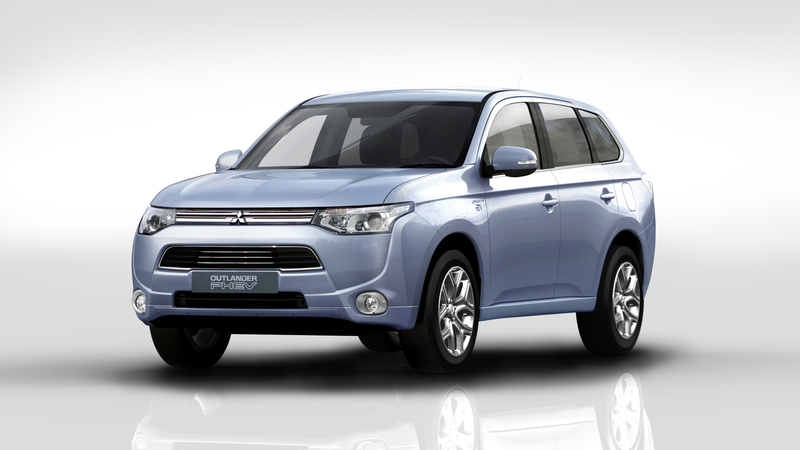 The Mitsubishi Outlander PHEV (plug in hybrid electric vehicle) is another story, however.